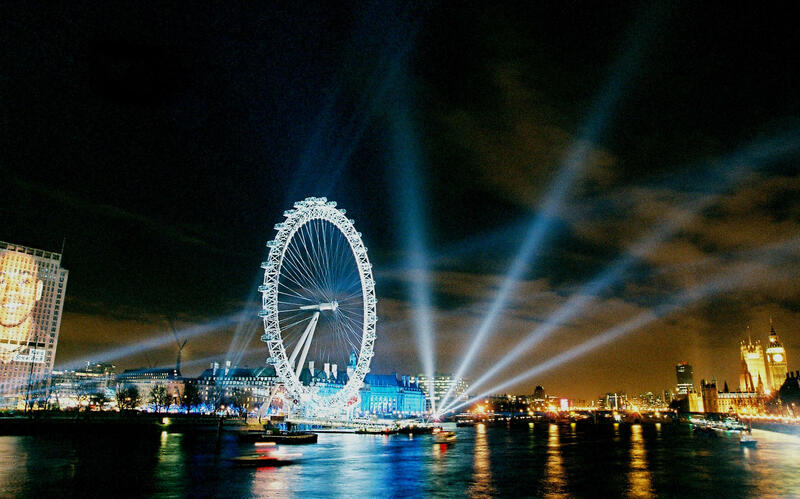 2010 was welcomed in style in London by the 200,000 strong crowds that turn out to see the display off the London Eye, and seen across the world on BBC 1 or online to celebrate the New Year and the new decade. 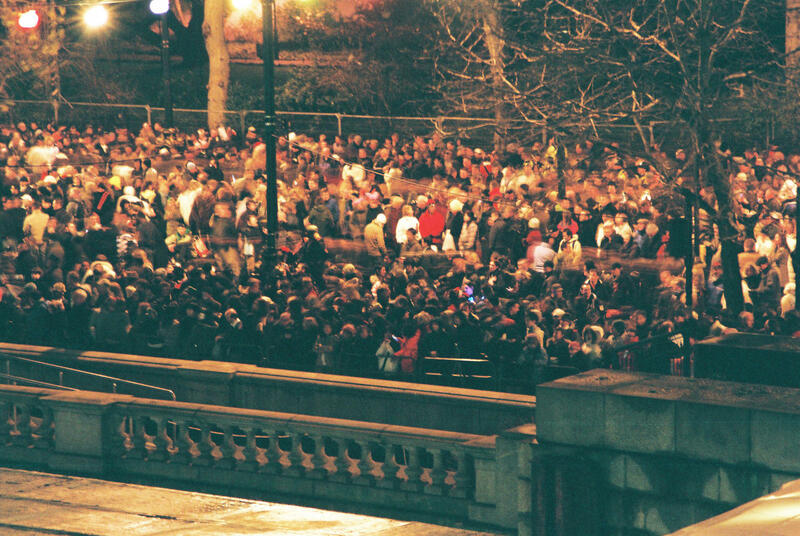 The display was open to all, with many people watching from the Embankment. Finding the best place to see the london new years fireworks display is important as people will start arriving at 8.00pm. It will start getting crowded from 9.30pm onwards, to get the best viewing spot means you need to be there early, but it is all to do with personal preference. Westminster bridge and the North embankment, opposite the London Eye, are the best places to see the display. The display lasts 8 minutes and will be visible from many parts of London and will also be on television, for those who wish to watch it from the comfort of their own living room, or cannot get there. The show was originally commissioned by London Mayor Ken Livingstone and the GLA and produced by Jack Morton Worldwide. 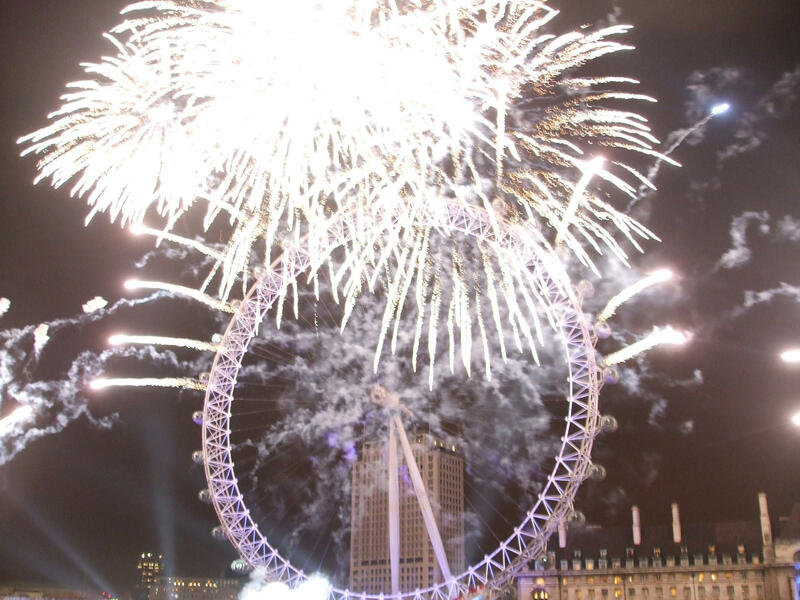 Now Boris Johnson continues the New Years festivities with the display on the London Eye, still using the old team of Groupe F, Jack Morton and Phoenix Fireworks. 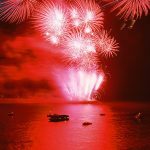 The fireworks were designed and executed by the French company Groupe F, but with significant input from Phoenix Fireworks, who work alongside the French pyrotechnicians, as well as providing storage, transport and other logistical services. 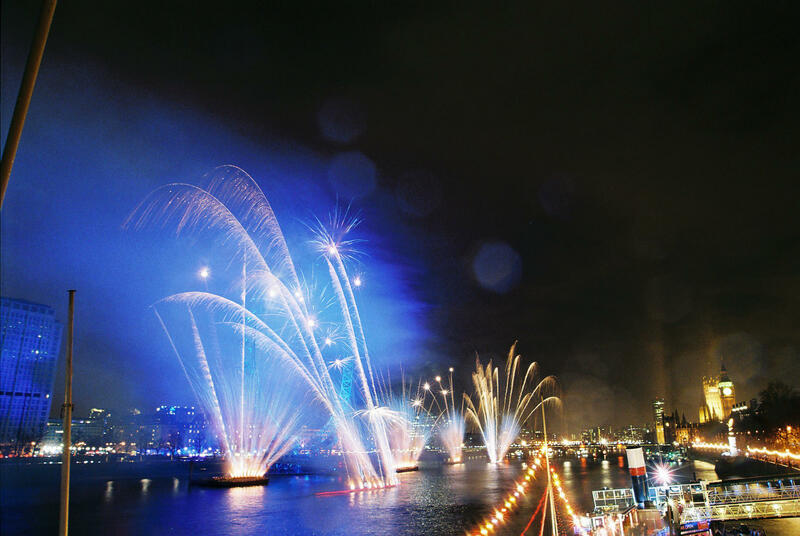 Christophe Berthonneau, from Groupe F, is most notably known for his New Years eve displays, Olympic displays and other large scale display all across the world, including a display off the Eiffel Tower to welcome the new millennium. 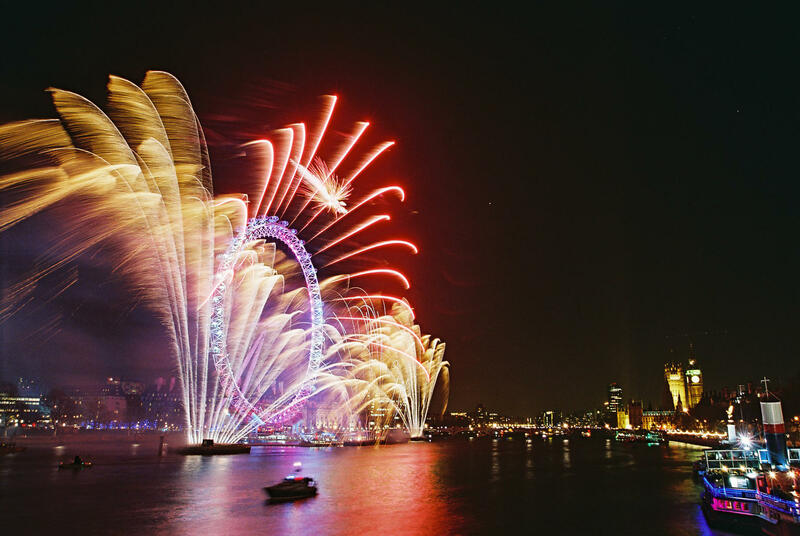 The tube, DLR, buses and trams will be free from 23:45 on New Years eve until 04:30 on New Years day. The tube, DLR, trams and National Rail services will also be running all night. Night buses and 24 hour buses will run, but there will be a reduction in service between 19:00 and 03:00 as a result of road closures. Please note some smaller stations will not be open for the whole evening. Check details before traveling. The congestion charge will be suspended so you will not have to pay to drive into central London. The display was be fired using six computers. 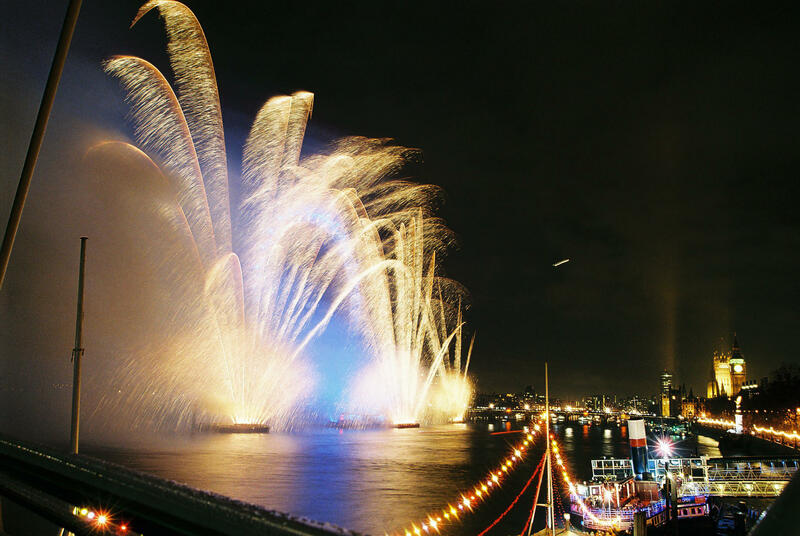 The display is programmed into the computer, with each firework having its own individual cue on the computer programme set at a certain time. When the appointed time is reached, a current is fired to the required firework along a series of wires, which causes the electric igniter to ignite the firework. This is done by the current causing the pyrotechnic content to heat up and combust, which creates a small explosion and therefore lighting the firework. A GPS system is used to connect the three computers and counts down to 12 o’clock. There were 3 barges in front of the London Eye, two of which carried cranes with fireworks being fired off them. 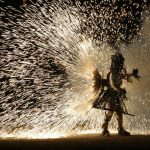 A team of 30 pyrotechnicians work on site from the 27th December right up to New Years day, with considerable work completed beforehand in the workshop. All the fireworks that are fired off the eye are mounted on New Years eve from 6pm, which is when the Eye is closed to the public, by a special team of expert climbers. Phoenix Fireworks received a delivery of 124 boxes of fireworks at the end of November all the way from France. The fireworks in these boxes needed to be individually fused in the workshop ready to be fired on the London Eye. This involves connecting an electronic igniter into each firework, and then labelling each with the line that it is part of. 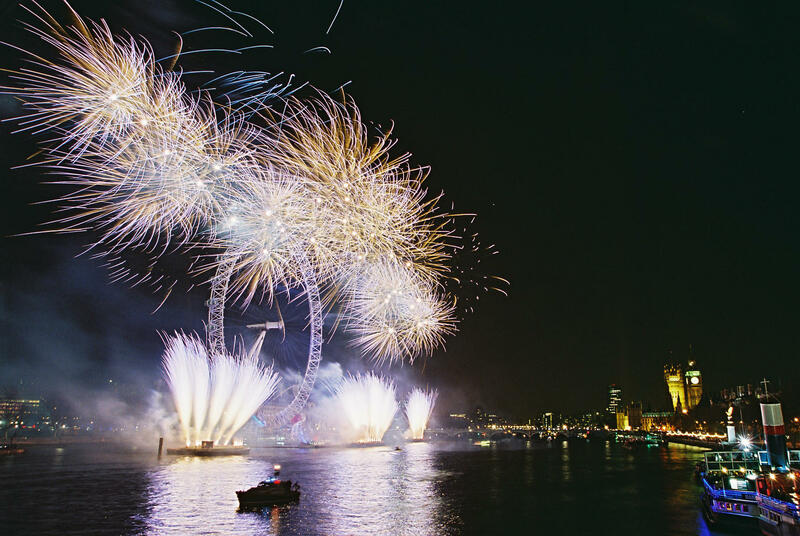 The fireworks were then taken up to our site in London to set up. The set up involves putting crates together in groups, which the shells are fired from on the barges in front of the Eye. Single shot fireworks and candles were places in racks that are then put on the barges, cranes and the London Eye. Each of the fireworks needs to be connected to a ‘raffaleur’, which is an electrical connection module, so that each firework can receive an individual current so it can be fired when required in the sequence required. A team of about 20 worked from 8 – 6 for 5 days to get the display ready. A night crew of about 5 to put the fireworks on the eye when ready. The night crew have to have high access licences and attach the fireworks to brackets on the eye, that are placed between the capsules during the week. Only a few of the fireworks can be put in place before the 31st December, which means that a lot of work is left to the few hours before the display, as the fireworks can only be put on the eye from 6pm on the 31st because it is still open to the public until then. So with all fireworks set on the eye, it is locked into place, so that the top capsule is just a few degrees off centre! Working on the eye was long, hard work, especially on the days when it rained heavily and half of the crew were working outside, not in the tents! There were three groups working, two in tents and one outside. Each group had a section of the display to work on; the barges, the cranes and the eye. Having done so much work preliminary work on the display, everyone was nervous to ensure that it does go well. As well as the anticipation to see that all our hard work went to create a beautiful and breath-taking display, as we thought it should do as Groupe F’s designs are always stunning. The previous years displays can contest for that! As always, Groupe F did produce a display that could not be bettered. An awe-inspiring spectacle of light and sound to really welcome in the new decade and mark the London Eye fireworks 10th year anniversary. 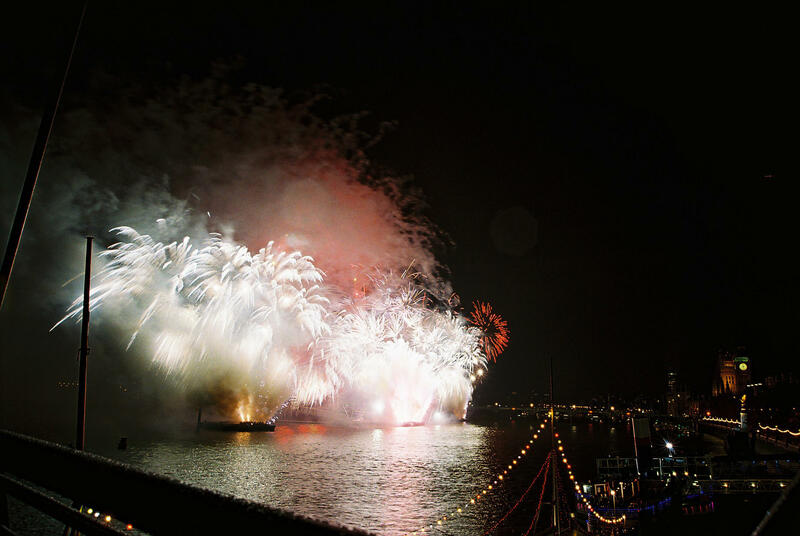 Jonas Bidault, who designed the display, told the BBC that there would be no music, in order to let the percussion of the fireworks do the talking. He also created a 350m long rainbow in the display, which is symbolic of the happiness that 2010 should bring and the countries coming together. Working on the London Eye fireworks was hard work but good fun. It enabled me to meet more of the pyrotechnicians from across the world and get a perspective of a much bigger display than I had done before.